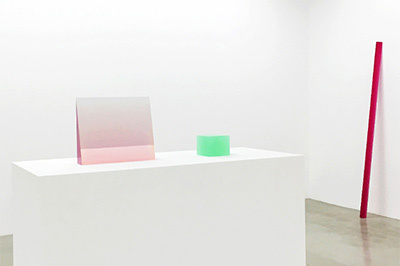 Parrasch Heijnen Gallery is pleased to announce Peter Alexander Sculpture 1966 – 2016: A Career Survey, a select survey exhibition of resin works by Los Angeles artist Peter Alexander. This show includes both the artist’s early and recent forays into his pioneering use of industrial resin as a sculptural medium, providing an unprecedented opportunity to chart the development of the most celebrated genre of Alexander’s five-decade practice. In the late 1950s and early 1960s, Alexander studied architecture at the University of Pennsylvania; the Architectural Association School of Architecture, London; and the University of California, Berkeley before switching to studio art at the University of California, Los Angeles, where he received his BA in 1965 and his MFA in 1968. He happened upon the sculptural potential of polyester resin while repairing his surfboard, immediately responding to the liquid material’s transparency and water-like quality. Alexander first created his groundbreaking resin works as a graduate student at UCLA. There, the works caught the attention of Los Angeles artist Billy Al Bengston who recommended them for an exhibition he was co-curating. Alexander continued to cast polyester resin in various geometric and wall mounted forms to considerable acclaim until 1972, when the toxicity of the medium forced him to seek other avenues of expression. He then refocused his practice exclusively to pictorial translations of the same optical ideas into painting and drawing until 2007. The following year, he began working with a low toxicity polyurethane when he was commissioned to refabricate a 1971 resin bar that was damaged beyond repair after exhibiting in Los Angeles 1955-1985: A Birth of an Artistic Capital at the Centre Georges Pompidou. Alexander employed cubic, pyramidal, and wedge-like forms in resin as vehicles for focusing and bending light to achieve varieties of gradation and emanation. He refers to his sculptural boxes as “rooms” or “quiet places to go,” much like a Vermeer interior and the wedges as “objects that disappear at the top; like water does when it meets the continent, it becomes part of whatever environment it is in, and if it becomes part of it, then you become part of it.” Although Alexander is largely known for his use of plastics, this show brings to focus the artist’s acutely refined manipulation of color as he works to make light interact with space, evoking the essence of air and water. The works in this exhibition demonstrate the different stages in Alexander’s exploration of resins and pigments, transparency and translucence. His vision is one of creating a generative object: an entity that appears to emit its own light and energy. Peter Alexander has been widely exhibited in galleries and museums worldwide since the mid-1960s, including five solo exhibitions at Franklin Parrasch Gallery, New York. This career survey is Parrasch Heijnen’s first exhibition of Alexander’s work and includes more than two-dozen extraordinary examples, many of which were generously loaned from private and museum collections. Alexander has received multiple honors and awards including a National Endowment for the Arts Fellowship in 1980 and the California Art Award in 2014. In 1999, the Orange County Museum of Art (Newport Beach) mounted a retrospective exhibition In this Light inclusive of painting and sculpture. His work resides in the permanent collections of numerous institutions including the Solomon R. Guggenheim Museum (New York), the Metropolitan Museum of Art (New York), the Los Angeles County Museum of Art (Los Angeles), and the Museum of Modern Art (New York). Peter Alexander will be on view at Parrasch Heijnen Gallery, 1326 South Boyle Avenue, Los Angeles, from July 9 – September 3 with an opening reception Saturday, July 9, 3 – 6p.